Tumwater High School’s Peyton Russell and Rainier High School’s Peyton Dungan successfully defended their titles, while Northwest Christian’s Heidi Sowers notched her first at the 2016 state high school girls’ track and field championships. Despite being slowed by injuries throughout her senior season, Russell won her third consecutive triple jump title at the 2A state meet at Mount Tahoma High School in Tacoma. Unlike last year when she won the championship with a meet-record jump of 40 feet, 8 inches, Russell needed her final attempt (37-03.75) to clinch this year’s crown. 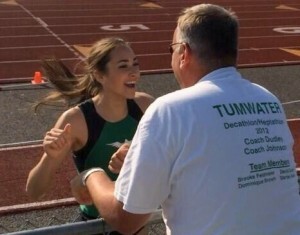 With the victory, Russell, who will attend the University of Miami on a track scholarship, becomes the first female athlete at Tumwater to win three straight track titles in the same event and just the second to accomplish the feat in the triple jump in the 2A classification, joining Pullman’s Lindsay Myron (2004-2006). Tumwater’s Peyton Russell capped her stellar high school career by winning her third consecutive 2A state triple jump championship. Russell also joins a select group of Thurston County athletes as she is just the third to win three or more triple jump state championships. Timberline’s Johnny Taylor won a trio of 3A triple jump state titles between 1984 and 1986, while LaShonda Christopher captured four titles, her first two while a student at Timberline (1992 and 1993) and the second batch at River Ridge (1994 and 1995). As Russell was celebrating the end to her brilliant high school track career, Dungan was doing the same across the state at the 2B meet at Eastern Washington University. Dungan made it back-to-back state shot put championships by posting a PR of 41-9.25. She won last year’s title with a throw of 38-5.75. 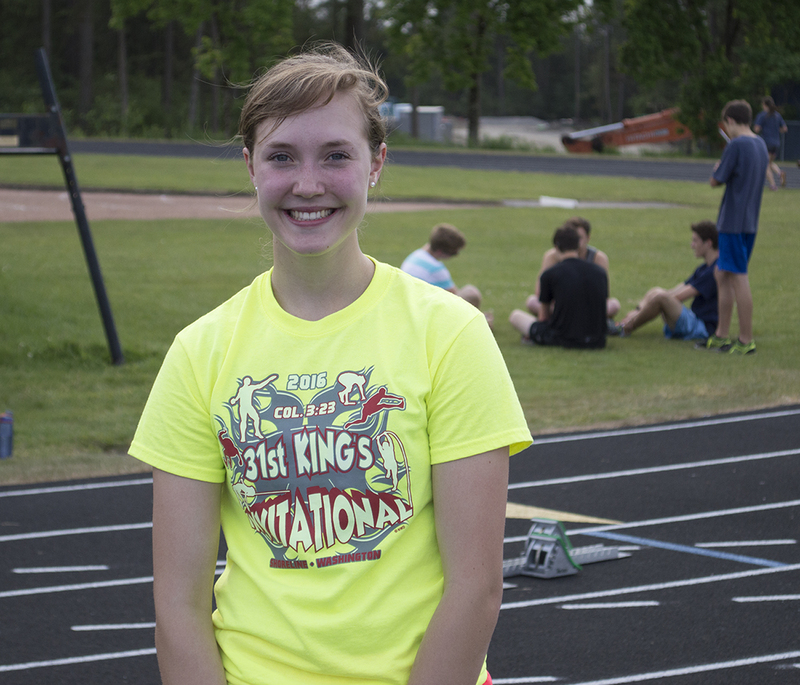 Sowers highlighted a strong showing for Northwest Christian by winning the 300 hurdles. The victory comes a year after the junior finished second in the event. Both years she posted the exact same running time of 45.87. She also finished second in the triple jump, third in the 100 hurdles and helped the Navigators 4×400 relay team take fourth place. Rainier’s Peyton Dungan (left) became a two-time state champion after successfully defending her 2B state shot put title. Northwest Christian received an equally impressive performance out of junior Elizabeth Stottlemyre, who finished second in the javelin. Her throw of 145-06 surpassed her personal record by more than 12 feet. Defending champion Emily Engle of Okanogan won her second straight title with a throw of 154-04, but that’s not to say there weren’t some dramatics. Stottlemyre, who had yet to reach the 130-foot mark this year, posted a 132-09 on her first attempt and 135-04 on her fourth before clearing that distance by 10 feet in her last throw. 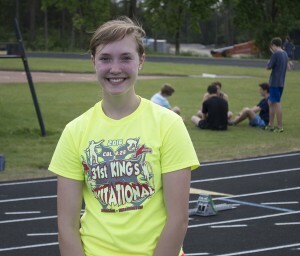 Elizabeth Stottlemyre helped Northwest Christian finish fourth at the 2B state meet with a second-place finish in the javelin. 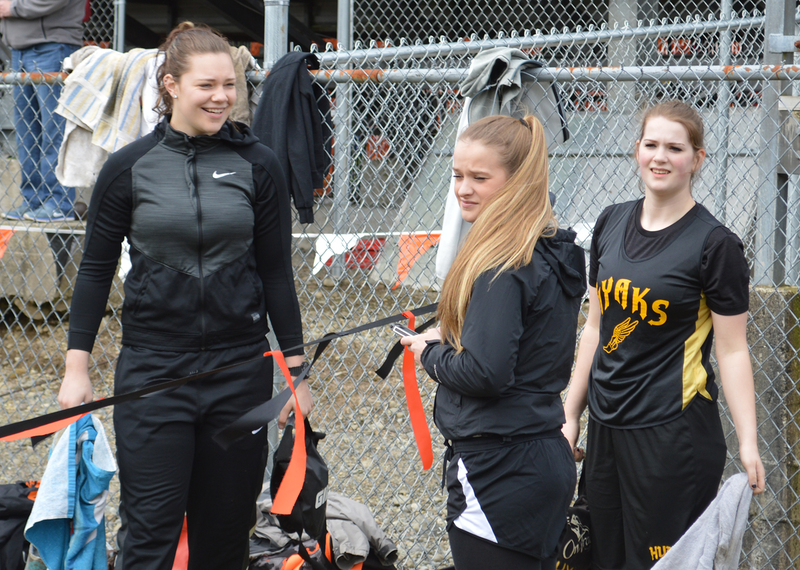 The junior’s throw of 145 feet, 6 inches bettered her previous highmark by more than 12 feet. Stottlemyre, who teamed with Sowers, Qi Kan and Megan McSheffrey in the 4×400 relay, claimed third place in the event last year as a sophomore. In addition to the fourth place finish as a member of the Navigators relay 4×400 relay, McSheffrey also finished third in the 400, fifth in the 800 and seventh in the 300 hurdles. Sophomore Eilana Summers also helped Northwest Christian’s overall team placing by collecting a second-place finish in the 3200 (11:39.19). Marika Morelan of St. George’s, last year’s runner-up, finished first with a time of 11:35.03. St. George’s won the overall girls 2B title with 71 points. Okanogan (70.5 points) and Napavine (65) finished second and third, respectively. It marks the sixth straight top five finish for the Navigators, who won the state title in 2007 and 2013 and finished second in 2011, 2012 and 2014. Tumwater junior Bella Foos made three trips to the 2A podium, finishing fourth in both the 200 and 400 and joining Tiana Cole, Sydney Smith and Codi Short on the Thunderbirds’ 4×400 relay team which claimed sixth place. The T-Birds also received a third place finish in the pole vault from Anna Chartrey, while Timberline got a third place finish from Selina So’oto (shot put) and fourth place from Keshara Romain at the 4A meet.